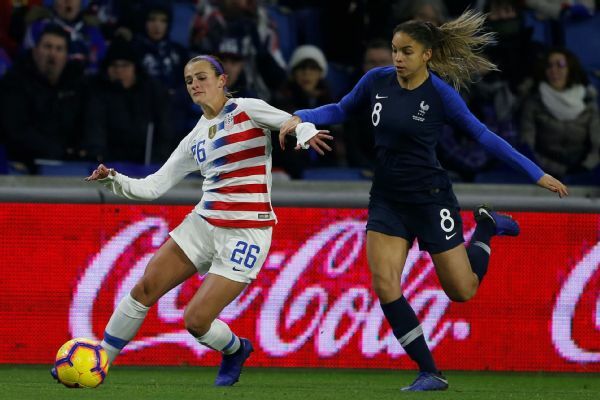 Mallory Pugh scored a late consolation goal, but the USWNT was soundly beaten in France by the 2019 World Cup hosts in its first match of 2019. The U.S. has never gone undefeated in a World Cup year. That streak, at least, continues. 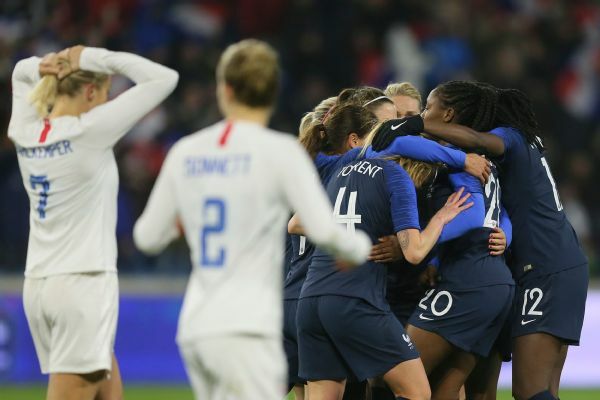 Opening its 2019 schedule in Le Havre, where it will also play a World Cup group game against Sweden in June, the U.S. lost 3-1 against host France on Saturday. Settling into her role as a running mate for superstar Eugenie Le Sommer, 23-year-old Kadidiatou Diani scored the first two goals for France, and substitute Marie-Antoinette Katoto had a third. Mallory Pugh scored the only U.S. goal with the game already settled. The result in Le Havre ended a 28-game unbeaten streak for the U.S., dating to a 2017 loss against Australia in Seattle. It also marked the second win in the past three meetings in the series for France, which begins its most important year ranked third in the world. 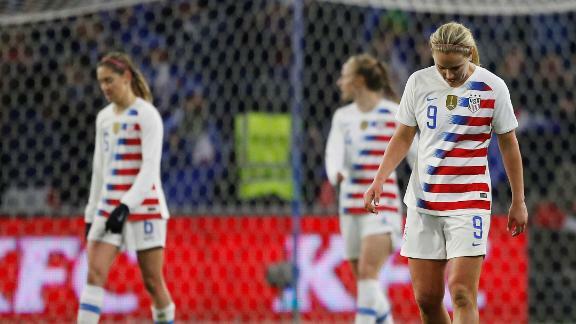 Depth at outside back is an issue for the U.S., as Emily Fox had a difficult first half Saturday against France's Delphine Cascarino. The French have outscored the U.S. 7-2 in three meetings in the past three years. The minus-five goal differential for the U.S. matches the same differential in a three-game stretch against Norway in the early 1990s as the worst ever against any European rival. As rare as losses have been for the U.S. of late, the result continued a streak of nearly two decades that has seen the U.S. start slowly. The loss was the third in a row in the opening game of a World Cup year. The U.S. hasn't won its calendar opener in a World Cup year since 1999. The French looked like a team that successfully navigated a transfer of generations and is fully capable of winning its first major title. The U.S. looked like a team just out of preseason. The U.S. looked like half a team. Without likely World Cup starters Julie Ertz, Tobin Heath, Rose Lavelle, Kelley O'Hara and Megan Rapinoe because of what were described as injuries and illnesses (only Lavelle was among the available substitutes on the bench), it kind of was. Saturday's game was never going to look like a CONCACAF qualifier, with the U.S. running rampant in possession against overmatched opponents. That was part of the reason for going on the road to play one of the best teams in the world in front of a full stadium of its fans. But after looking so good in high-profile games against Australia, Brazil and Japan last summer in the Tournament of Nations, the short-handed U.S. looked distinctly second best Saturday. That underscored how much those missing players fuel the aggressive style the U.S. wants to play (and after watching Alex Morgan look too isolated Saturday, how much of a role they play in what happens with possession). It also isn't a surprise. It shouldn't be cause for panic. Not only were U.S. players coming off their offseason, compared to French players in the middle of club seasons, but the Americans didn't tailor their preseason to the first two games. Instead of tapering activity to be freshest for France, they pushed through the duration of the preseason camp in Portugal -- coach Jill Ellis even used the phrase "boot camp" to describe the mentality. It isn't a surprise that some veterans would feel the effects to the extent that it made sense to rest them in a friendly on a cold night in France. Injuries are cause for concern this year -- it isn't a bold prediction to say the U.S. won't win the World Cup without half it starting lineup. That part of Saturday does have long-term significance. The result? That will have much less significance moving forward. The U.S. has unknowns all over the field. That isn't an indictment most of the time. Goalkeeper Alyssa Naeher is an unknown as a starter in a major tournament. But she earned the role over the past two years -- and played like it Saturday. The durability of Heath and Rapinoe on the experienced side of 30 is an unknown. But while the front line struggled without them against the French, Pugh would start for almost any other team in the world, and Christen Press has a better résumé than most any other insurance plan. The same is true in the midfield, even if Sam Mewis didn't get much time off the bench to show it Saturday. 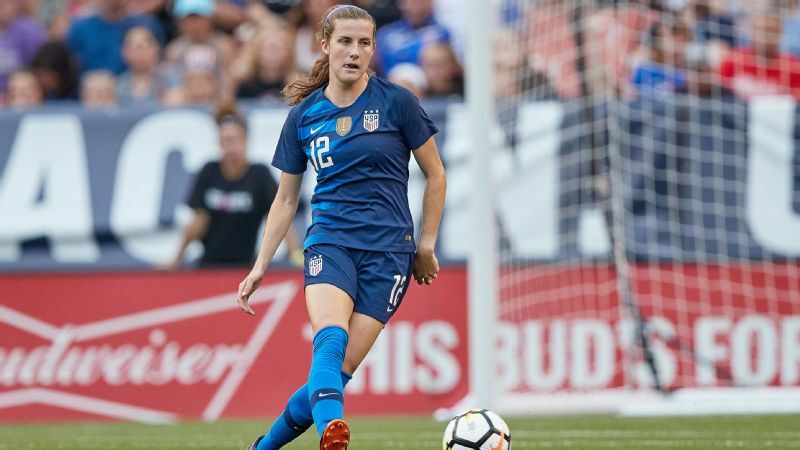 It's true at center back with the return of Tierna Davidson alongside Abby Dahlkemper and Becky Sauerbrunn. There are quality alternatives if one or two (not five) injuries demand them. 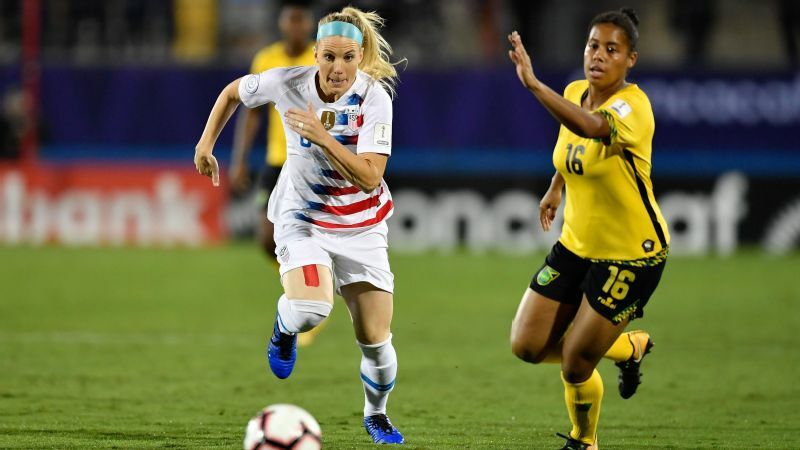 Outside back, on the other hand, remains an unknown that should terrify the U.S. And Saturday exposed a lack of depth behind expected World Cup starters O'Hara and Crystal Dunn. None of that is Emily Fox's fault, though she obviously suffered through a difficult first half against France's Delphine Cascarino, including the sequence that led to the first goal. Still just halfway through her college career at North Carolina, Fox is a promising name for the future. She is also the latest in a long line of experiments that don't appear to have uncovered a viable option for competing against the likes of Cascarino and France in the present. It doesn't get much easier for the U.S. when it travels to play Spain in Alicante on Tuesday. The France game was always the centerpiece of the trip, the reason to start the year abroad. But the second game is far more than an afterthought. It's the first meeting between the two teams, and it comes with Spain making a rapid ascent in the women's game. Dominant at the youth level, winning last year's U-17 World Cup and finishing second in the U-20 World Cup, the senior team breezed through World Cup qualifying without a blemish. Bouncing back from Saturday with a blowout against a nobody wouldn't show much. How the U.S. responds against a team looking to prove itself a World Cup contender will be telling.